Texas has an opportunity to become the first state to pass a law that is closer than any other state law to truly integrating constitutional parental rights protections language into their Family Code. On Wednesday the JJFI committee will be hearing public comment on a parental rights protection bill, HB 2756. This bill is great with one major exception, parents going through separation or divorce will still be left out. The meeting will be held at 10:30 a.m. at the state capitol building in Austin in room E2.012. JJFI stands for Juvenile Justice & Family Issues. Each of the legislators e-mails are linked down below at the end of this post to make it easy for you to click and send them your testimony. HB 2756 is an attempt to update the public policy and the best interest policy of the state with language from caselaw regarding parental rights — with one caveat — it does not include when two parents are in a suit against each other. The bill reads that these rights apply only to “a suit between a parent and a non-parent,” continuing the longtime bias, wrong, and unconstitutional presumption that when two biological parents are in a suit against each other that these rights cancel each other out and therefore the state may inject its own personal beliefs and biases (viewpoint) according to one sole judicial official. This is viewpoint discrimination and is the reason parents cannot predict what will happen in child custody suits when they go through divorce or separation. This creates inconsistency and instability in families. This is also marital status discrimination, which the Family Code already says is not allowed. HB 2756 discriminates against children, it creates two separate classes of children. If two parents are in disagreement then the child does not receive these protections. Texas Family Code 153.003 does not allow marital status discrimination. How is two parents in divorce, separated, or never married, suing each other, and the court subjecting the child to lesser protections than the child whose parent is being sued by a non-parent, not marital status discrimination? This bill clearly leaves the child’s rights subject to this discrimination. Why should a child receive any less protection from government interference into their relationship with each parent just because the two parents are in dispute? Should the child be punished? Should the parents be punished using their child as the source of punishment? This harms the child. A child is already under enough stress when their parents are splitting up or not in agreement, they certainly don’t need to be worried about losing one of their parents time, authority, or influence. When a parent is splitting up with the other parent or has never been married to the other parent, if they want their rights protected, they are required to file a lawsuit to get them protected, see Texas Family Code Sec. 6.406. It is a Mandatory Joinder of Suit Affecting Parent-Child Relationship (SAPCR). Even if you are not in a divorce, never been married, and even if you have never lived with the other parent, you will have to file a SAPCR to get a parenting plan established by the court if the other parent and you cannot agree. These are bad policies in the first place. You should not have to file a suit to get a parenting plan. Parenting plans should start with equal parenting plans regardless of whether there is agreement. Then if there is a problem or the other parent is being irresponsible and not ensuring that the child is cared for and not contributing to the care of the child, the parents would have something to take to the court to complain about. This doesn’t mean that one parent gets to complain if the other parent has their mother or another adult care for the child during their time. This doesn’t mean that each parent has to spend the same amounts on the child. This doesn’t mean that either parent gets to control the other parent’s decisions and choices for the child. This means that neither parent should be interfering with the other, even if that other parent’s choices are not favored by the other parent. This does not mean that either parent is allowed to abuse the child. It means that the family courts don’t get to assign a different definition to what qualifies to interfere with either parent-child relationship even if one of the parent’s makes decisions that the judge may not favor either. This bill gives you opportunity to reduce the length of time a suit takes. When the court applies the parental rights protections to a parent regardless of who is suing them, if the other party cannot meet the requirements to overcome those protections then the suit ends. The child’s resources that come from each parent then are not used up in legal costs. Guardian ad litems and amicus, and other court-appointed experts are not needed as often. Proving one parent is better than the other is less likely to work to reduce rights. Parents can move on to re-establishing their new normal, they are less likely to be driven into bankruptcy, they don’t have to sling mud, dig up dirt on the other parent, trigger the other parent, and they settle down sooner. How can this not be good for the children? This is your opportunity to get rid of some of the bad precedent. This can be a new beginning to putting an end to the discrimination by doing something about the language in this bill, HB 2756. This bill gives you opportunity to put some major corrections into the Texas Statutes. (Keep reading, we give you some talking points and have linked each legislator’s e-mail into this post to make it easy for you to e-mail them if you are not able to make the public hearing tomorrow.) This is your opportunity to educate your lawmakers and make a difference. Legislators appreciate all the information and education they can get. Without the changes we recommend, the family courts will continue their status quo and will continue relying on their own personal beliefs and biased viewpoint of what is in your child’s best interest. 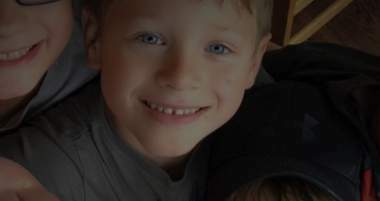 The judge and appellate courts will continue to rely on best interest of the child standard (BIC) and precedent between two fit parents who disagree with each other even after this bill passes; if the bill is left with the words “a suit between a parent and a non-parent.” The state of Texas will continue its biased policies based on changing marital status, against divorced and separated parents policies, to continue to hurt children. Children have the right to equal protection to family association with both of their parents and to not be treated different than other children when their parents are no longer together, and most importantly when their parents are in disagreement. An attack on children’s rights to maximum or equal association to both parents when their parents separate, violates the child’s right to consistency and reliability of the laws. HB 2756 as it is will continue to treat children like second-class citizens when their parents disagree on what is best for them. Parents will continue to be punished for choosing to divorce or never married in the state of Texas and their children will continue to pay the price. That price is increased anxiety in children, increased risk of depression, increased risk of making unhealthy choices, unhappiness, parental alienation, effects on their future health and opportunity, and increased risk of suicide to name a few. According to the US Department of Health, children who lack a fulfilling relationship with their father are 63% more likely to commit suicide. The Center for Disease Control (CDC) reports that 85% of all children who show behavioral disorders come from fatherless homes and the U.S. Department of Health and Human Services found that 71% of pregnant teenagers lack a father. The risk to children losing a father continues to be high. According to the U.S. Census Bureau, in 2016 about 4 of every 5 (80.4 percent) of the 13.6 million custodial parents were mothers, while 1 of every 5 custodial parents were fathers (19.6 percent). This is up from 16.9% in 2004. These numbers had not changed significantly since 1994. If you cannot make the public hearing, you can also submit your testimony in writing to all of the legislators on the JJFI committee. You can send your testimony to any of the representatives on the committee and request in writing that your testimony be added. Remember to put all of the following information at the top of your e-mail: Name, Address, Bill number you are testifying on, your position on the bill (i.e. for, against, neutral). 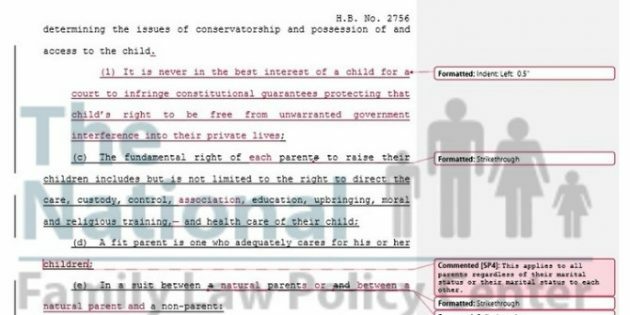 An example of how you can state a position is you can state that you are for the bill with a change and state that you want the reference to “non-parent” removed and that you want all parents going through any suit that affects the parent-child relationship to receive these rights protections. Protect children by keeping Texas legislators informed. There is also a house witness registration link where you can register in advance to testify in person. A BILL TO BE ENTITLED AN ACT relating to the protection of parental rights. BE IT ENACTED BY THE LEGISLATURE OF THE STATE OF TEXAS: SECTION 1. Chapter 153.002, Family Code, is amended to read as follows: Sec. 153.002. THE FUNDAMENTAL RIGHT OF PARENTS AND THE BEST INTEREST OF CHILDREN. 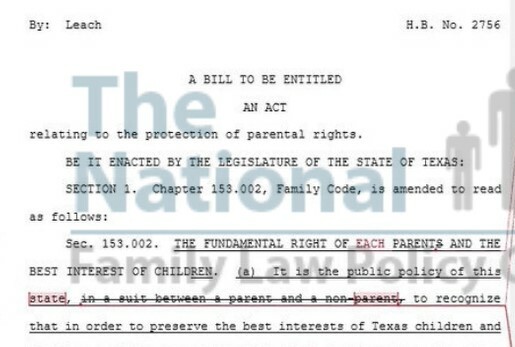 (a) It is the public policy of this state, in a suit between a parent and a non-parent, to recognize that in order to preserve the best interests of Texas children and families the state may not inject itself into the private realm of the family to interfere with the right and the high duty of parents to raise their children without first overcoming the presumption that a parent is fit and that a fit parent acts in the best interests of their child; (b) The best interest of the child shall always be the primary consideration of the court in determining the issues of conservatorship and possession of and access to the child; (c) The fundamental right of parents to raise their children includes but is not limited to the right to direct the care, custody, control, education, upbringing, moral and religious training, and health care of their child; (d) A fit parent is one who adequately cares for his or her children; (e) In a suit between a parent and a non-parent: (1) Neither the State of Texas nor any political subdivision of this state may restrict or interfere with a parent’s fundamental right to raise their children unless it is demonstrated that the restriction or interference is both: (A) essential to further a compelling governmental interest; and (B) narrowly tailored to accomplish the compelling governmental interest; (2) A court in this state may not interfere with the fundamental right of parents to raise their children simply because the court believes a better decision could be made. Before a court may interfere with the fundamental right of parents to raise their children, the court must first overcome the presumption that the parent is fit and that a fit parent acts in the best interests of their child. Any restriction on or interference by a court with a parent’s fundamental right must be supported by a finding that: (A) the parent is unfit; or (B) the interference is necessary to prevent a significant impairment of the child’s physical health or emotional well being; (f) Nothing in this section shall be construed to limit the right of the state to investigate or act upon a report of child abuse or neglect allegedly committed by a person responsible for a child’s care, custody, or welfare beyond the limitations already required by the United States Constitution. We requested that this bill be made applicable to all parents regardless of their marital status and regardless of who the suit is between, but this has not been done. Representative Leach is the author of the bill. Check back here later for a letter with our testimony in it. We invite you to join NFLPC, become a member and help us continue to help you educate the legislators and the state on your parental rights and your child’s right to be equally protected regardless of whether it is a non-parent or another parent in the suit. Click on any of the links below and it will take you directly to each of the house representative e-mails where you can write your testimony. Make sure you instruct them that you want this entered officially as testimony. If it is after the date of the public hearing, you can still have your voice heard by e-mailing your testimony to them and letting them know that you want it included in their consideration. If the bill was already voted on in the committee and made it through subcommittee, it is still worth being heard because the bill will have to get to the full floor for a vote from the entire body of house lawmakers. It’s not too late, you can have an impact still and you can make a difference. That difference just might be saving the life of a child from the devastation of loss of one of their fit parents and all of the effects that comes along with that loss.